Place the 5 Pyramid tiles as a stack onto their space on the Game board. Sort the Leg Betting tiles by their color (5 colors in total). Then stack the 3 tiles of each color in the following manner: the 2-money tile on the bottom, the 3-money tile in the middle, and the 5-money tile on top. Then place each stack onto the space of its color on the Game board. Place the 5 Camels onto the tents next to the Leg Betting tiles, each onto the tent of its color. Sort the Egyptian Pound coins and cards by their values and place them as a supply next to the Game board. This supply is called the "bank". Give each player the 5 Race Betting cards of one character as well as the Desert tile of that character. Return any spare Race Betting cards and Desert tiles to the box. Each player keeps his hand of five cards hidden from the other players and places his Desert tile in front of him. Give each player starting capital of 3 Egyptian Pounds, which he places in front of him. Give the Leg Starting Player marker to the youngest player. Now, the youngest player determines the starting positions of the Camels by taking the 5 Dice and rolling them together. Then he takes the 5 Camels from their tents and places each onto a specific space of the Race track: Each Camel whose matching Die has a facing up, he must place onto space 1 (the space with flag 1). Each Camel whose matching Die has a facing up, he must place onto space 2. Each Camel whose matching Die has a facing up, he must place onto space 3. Finally he stacks up all Camels which stand together on the same space. The Camels move clockwise around the Race track. 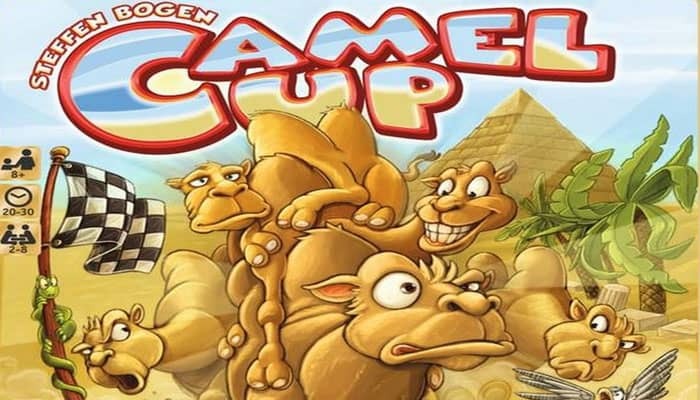 During the game, the players move the Camels using the Pyramid. When a player turns the Pyramid upside down and pushes the slider, he reveals 1 colored Die. Then he must move the Camel of the revealed color as many spaces forward as the Die shows. Camels on the same space always form a Camel stack. If a Camel is moved that is part of a Camel stack, it carries along all Camels that sit on top of it. Any Camels beneath it are left where they are. Since sometimes single Camels and sometimes Camel stacks are moved, we use the term Camel unit. A Camel unit consists either of a single Camel or a stack of Camels. If a Camel unit ends its movement on a space where there is another Camel unit, it jumps on top of that other unit. Important: For all purposes of ranking, a Camel that sits on top of another Camel is always considered ahead of the Camel it sits on. The race comprises several Legs. A Leg ends when the last of the 5 Dice has come out of the Pyramid and the respective Camel has moved. Right at the end of each Leg, a Leg scoring round occurs, in which players receive or lose money according to the tiles they have acquired during the Leg. Afterwards, a new Leg starts by returning the acquired tiles to the game board and the 5 Dice to the Pyramid. The currency in this game is Egyptian Pounds (from now on also referred to as EP). You must store your money publicly in front of you. However, you may stack it up in any way you want. For the duration of the race, no player is obliged to disclose his exact amount of money. At any time during the game, you may exchange money one-to-one with money from the bank (for example, exchanging five 1 Pound coins for one 5 Pound coin and so on). No player can drop below 0 EP. This means when you do not have the money to pay a lost bet, you are spared from doing so. The player with the Leg Starting Player marker begins the first Leg (and thus the game) by performing exactly 1 action. Then the player to his left performs 1 action, then the next player and so on. Therefore, play proceeds continuously in a clockwise direction. There are 4 possible actions. Take the top Leg Betting tile of any stack (and thus back the Camel of that color to win the current Leg). Place your Desert tile onto the Race track. Take 1 Pyramid tile and then move 1 Camel via the Pyramid. Bet on the overall winner OR overall loser by placing 1 of your Race Betting cards face down onto the appropriate Betting space. The game ends as soon as the first Camel crosses the finish line. 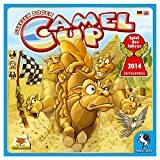 Then a final Leg scoring round occurs, as well as an End scoring round for the overall winning Camel and the overall losing Camel. Take the top Leg Betting tile from any stack on the Game board and place it in front of you. By doing this, you back the Camel of that color (which means that you hope it will be in the lead at the end of the Leg). There is no limit to the number of Leg Betting tiles you may collect throughout the Leg. You may even have several of the same color lying in front of you. Place your Desert tile onto an empty space of the Race track (that has no Camels or Desert tile on it). However, you are not allowed to place it onto a space that is adjacent to a space that already contains a Desert tile. Also, you may never place your Desert tile onto space 1 of the Race track. If your Desert tile is already on the Game board, you may use this action to move it to a different space (following the same rules). When you place (or move) your Desert tile, you can either place it with its Oasis side up or with its Mirage side up. Depending on the side, the Desert tile will influence the movement of Camels that stop on the tile in different ways. Take the top Pyramid tile from the stack on the Game board and place it in front of you. Then immediately take the Pyramid, shake it thoroughly, and reveal one Die from it. Note: If no Die appears, turn the Pyramid back up and shake it once more before trying the steps above again. After you have revealed the Die, move the Camel of its color as many spaces forward as shown on the Die: 1, 2, or 3 spaces. Remember: If you move a Camel that is part of a Camel stack, it carries along all Camels that sit on top of it (and forms a Camel unit with them). Example: The orange Die is revealed and shows a 3. The orange Camel moves 3 spaces forward carrying along the yellow Camel. Example: The white Die is revealed and shows a 2. The white Camel moves 2 spaces forward, carrying along the green Camel. Since the yellow Camel is already on the space on which they end their movement, white and green jump on top of it as a unit. If the tile has its Oasis side facing up, the Camel unit moves 1 space forward. If it thereby lands on a space where there is another Camel unit, it jumps on top of that unit as usual. If the tile has its Mirage side facing up, the Camel unit moves 1 space backward. If it thereby lands on a space where there is another Camel unit, however, it is placed underneath that unit. In both cases, the Desert tile remains on its space (at least until the next Leg scoring round). After you have moved the appropriate Camel, place the revealed Die onto the tent of its color. This way, everybody can keep track of which Dice are already out of the Pyramid. Keep the acquired Pyramid tile lying in front of you. In the next Leg scoring round, you will receive 1 Egyptian Pound for each Pyramid tile you have acquired during the Leg. As your action, you can bet on the overall winner. This means, you secretly back the Camel that you believe will be in the lead at the end of the game. To do this, secretly choose 1 of your Race betting cards (in the color of the Camel you think will win) and put it face down onto the Betting space for the overall winner. You may instead bet on the overall loser (backing the Camel that you believe will be last on the Race track at the end of the game) by secretly choosing 1 of your Race Betting cards and putting it face down onto the Betting space for the overall loser. If there are already any cards on your chosen Betting space, you simply put yours on top of those cards. Once placed, a card must stay where it is, even if you later realize you backed the wrong Camel. However, as long as you have cards in hand, you may always choose as your action to place 1 of them onto either Betting space. Start by giving the Leg Starting Player marker to the player that sits to the left of the player who just took the last Pyramid tile (so you will remember who will start the next Leg). Then see which Camel is in the lead (on the space farthest along the Race track). If there is a stack of Camels in the lead, the leading Camel is the one on top of the stack. Now, each player gains or loses Egyptian Pounds according to the Pyramid and Leg Betting tiles lying in front of him. Each player adds up his total amount and then takes it from (or pays it to) the bank accordingly. For each Leg Betting tile of the leading Camel, the player gains the number of Egyptian Pounds printed in large on the tile: 5, 3, or 2. For each Leg Betting tile of the Camel in second place, the player gains 1 EP. For each Leg Betting tile of any other Camel, the player loses 1 EP. For each Pyramid tile, the player gains 1 EP. 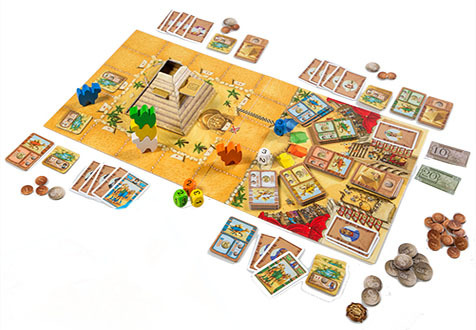 After all players have collected (or paid) their money, return all Leg Betting tiles and all Pyramid tiles to the appropriate spaces on the Game board (in the same way as in the setup). Also, remove any Desert tiles from the Game board and return them to their owners. 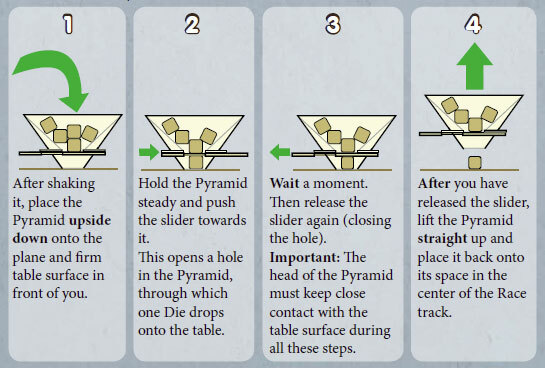 Finally, return the 5 Dice from the tents to the Pyramid. Then the player with the Leg Starting Player marker starts the new Leg. As soon as the first Camel unit crosses the finish line, the race ends immediately. Now, carry out the Leg scoring round one last time (as described on the left). After this final Leg scoring round, the End scoring round for the overall winner and overall loser occurs. For this, first attend to the face-down card deck on the Betting space for the overall winner. Remember: the card on the bottom was the first card placed, the card on top the last. Turn the entire deck face up, so that now the card placed first is face up on top while the card placed last is on the bottom. Now players gain or lose money according to the cards they have placed. Start at the top and go through the face-up deck card by card. The player (if any) that placed the first card showing the actual winner of the race receives 8 Egyptian Pound from the bank. The player (if any) who placed the second card showing the winner receives 5 EP, the third player 3 EP, the fourth player 2 EP, all others 1 EP. Remember: this only applies to cards showing the actual winner. For each card in the deck that shows any Camel other than the winner, the owner of that card must pay 1 EP to the bank. After going through the deck for the overall winner, go through the deck of cards for the overall loser in the same way. The overall loser, of course, is the least advanced Camel (in the case of a stack, it is the Camel on the bottom of the stack). After the End scoring round, all players count their money. The player who collected the most Egyptian Pounds wins the game. In the case of a tie, the victory is shared.